American basswood (Tilia americana), northernmost Tilia species, is a large, rapid-growing tree of eastern and central hardwood woodlands. Best growth is in the central part of the range on deep, moist soils; development is vigorous from sprouts as well as seed. American basswood is an important timber tree, especially in the Great Lakes States. The soft, light wood has many uses in wood products. The tree is also well known as a honey-tree, and the seeds and twigs are eaten by wildlife. It is commonly planted as a shade tree in urban areas of the eastern states where it is called American linden. -The native range of American basswood. Climatic conditions associated with the species range are generally continental-cold winters, warm summers, and a humid to subhumid moisture regime. Mean annual precipitation within the species range is 530 min (21 in) at the western limit and 1140 min (45 in) in the northeast. The northern limit of basswood approximates the -18° to -17° C (0° to 2° F) isotherm for mean daily minimum January temperature. Basswood reaches its maximum development in areas averaging 18° to 27° C (65° to 80° F) in July and receiving 250 to 380 mm (10 to 15 in) of precipitation during the growing season. The frost-free growing period varies from 80 to 180 days within its range. Studies relating to the presence of basswood to soil characteristics in Minnesota, Wisconsin, and Michigan indicate that stands in which basswood shared dominance were generally confined to sandy loams, loams, or silt loams, with basswood obtaining maximum development on the finer textured soils. Most soils were classified as Hapludalfs within the Alfisols order, although some Eutrochrepts (Inceptisols), Cryandepts (Inceptisols), mesic families of entic Fragiorthods (Spodosols), and Haplorthods (Spodosols) were noted. Basswood grows best on mesic sites, but it is also found on coarse soils such as the sand dunes near Lake Michigan (17) and on dry, exposed rock ridges in Ontario and Quebec (25). The species grows on soils ranging in pH from 4.5 to 7.5 but occurs more often in the less acidic to slightly basic part of this range. In fact, calcareous soils have been associated with the presence of basswood (9,17). The importance of aspect and edaphic factors to local distribution is reflected by the restriction of basswood throughout much of its range to moist sites on north- and east-facing slopes. Maple-basswood forests in southern Wisconsin are largely restricted to northerly exposures (19). Basswood is restricted to more mesic sites in southern Illinois and in northern Kentucky (5). At the western limit of its range, basswood frequently grows on the eastern side of lakes and along major drainages. This localized growth is often ascribed to fire protection. Although lack of fire may be a reason for the persistence of a fire-sensitive species such as basswood, presence and distribution are controlled more by soil moisture and the ameliorating effects of water on the local climate. Basswood is classified as a nitrogen-demanding species because it grows poorly on sites deficient in nitrogen. With increasing nitrogen supplies, basswood growth increases markedly, approaching a maximum radial increment when 560 to 670 kg/ha (500 to 600 lb/acre) of nitrogen are added. Basswood leaves have high contents of nitrogen, calcium, magnesium, and potassium at the time of leaf fall and they contribute most of these nutrients to the forest floor (13,28). American basswood grows in mixture with other species and only rarely forms pure stands. It is dominant in a single forest type, Sugar Maple-Basswood (Society of American Foresters Type 26). This cover type is most common in central Minnesota and western Wisconsin but is represented elsewhere from central Illinois, northward to southern Ontario and Quebec, eastward to northwestern Ohio, and westward along valley slopes of the prairie-forest transition (15). Sugar maple (Acer saccharum) dominates both overstory and understory layers, with basswood achieving the position of second dominant in the tree layer. Common associates are white ash (Fraxinus americana), northern red oak (Quercus rubra), eastern hophornbeam (Ostrya virginiana), red maple (Acer rubrum), and American elm (Ulmus americana). Basswood is one of the major species, with sugar maple, beech (Fagus), ash (Fraxinus), hickory (Carya), and oak (Quercus), in the Deciduous Forest Region of southern Ontario. It is a minor component of the sugar maple-yellow birch-hemlock-white pine climax forest type in the southern districts of the Great Lakes-St. Lawrence regions of Ontario (32). In the Mixed Mesophytic forests of the southern Appalachians, Tilia americana is replaced by T. heterophylla (9). The genotypic distinction between these species is not always clear, and T. americana does appear in the northern part of the Mixed Mesophytic region. Flowering and Fruiting- The fragrant, yellow-white, perfect flowers are borne on loose cymes on long stalks attached to leafy bracts. Flowering generally occurs in June but can begin in late May or early July, depending on latitude and annual variations in temperature. Flowering follows initial leaf-out and lasts approximately 2 weeks. During this period, all stages of floral development are present on a single tree or even in a single inflorescence (4 to 40 flowers per inflorescence). The flowers attract a number of insect pollinators. In a study of the pollination biology, 66 species of insects from 29 families were identified as pollinators of Tilia flowers. Bees and flies were the most common diurnal pollinators; moths were the primary nocturnal visitors (2). The fruit, a nutlike drupe 5 to 10 mm (0.2 to 0.4 in) in diameter, usually contains one seed but in collections from both open- and forest-grown trees, 12 percent of the fruit contained two seeds and less than 1 percent contained three seeds. The seeds have a crustaceous seed coat (testa), a fleshy yellowish endosperm, and a well-developed embryo. A variety of forms of fruit and seed have been noted, including egg-shaped, round, onion-shaped, conical, and pentagonal (34). Individual trees tend to consistently produce fruit of a particular form and size. Seed Production and Dissemination- Fruits ripen in September and October and are soon dispersed by such mechanisms as wind, gravity, and animals. Although the flower bracts are reported to aid in wind dispersal, fruits rarely are carried more than one or two tree lengths from the parent (24). In addition to their limited role in seed dispersal, bracts may act as "flags" to attract pollinators (especially nocturnal ones) to the inflorescences (2). Animals probably increase the seed dispersal significantly. The seed-bearing age for basswood generally ranges from 15 to 100 years, but seed production at age 8 years (10 years from seed) has been noted (45). The number of ripened fruits averages 9,700 to 13,200/kg (4,400 to 6,000/lb); green fruit averages 5,070 to 5,950 seeds per kilogram (2,300 to 2,700/lb) of fruit (17,33,35). Based on a number of collections, seed weights varied from 12 to 38 mg (0.18 to 0.59 gr) and averaged 31 mg (0.48 gr) (4). In a study for 26 years of 19 species in northern Wisconsin, basswood was one of the most consistent fall-maturing seed producers (18). It produced good seed crops 62 percent of the time from 1949 to 1974. When crown-released, basswood that were about 50 years old did not increase their fruit production during the 5-year period following release. Moreover, the quality of fruit remained poor throughout this period. In the third year after release, for example, only 5 percent of the fruit collected from the ground contained sound seed (37). The production of fruit without seed (parthenocarpy) and seed infestation by a lepidopterous larva are two common defects that affect seed viability. A pin hole in the pericarp indicates the presence of the larvae. The percentage of fruits with the pin hole was 3 percent in a September collection and 7 percent for an October collection in southeastern Ontario (35); 30 percent of fruits were insect infested in 45 collections from various parts of the natural range of basswood (4). In the same collections, the percentage of fruits with seed ranged from 0 to nearly 100, but the lack of sound seed on the forest floor seems to be the rule. Only 2 percent were sound out of more than 7,400 identifiable basswood seeds found in the litter in a northern Wisconsin stand. Seeds covered by leaves had rotted and most of the seeds lying on or in the upper litter layers had been destroyed by rodents (18). Seedling Development- Basswood seeds show a pronounced dormancy and generally germinate poorly regardless of seedbed conditions. The primary cause for the lack of quick germination is an impermeable testa. Using organic acids to digest the pericarps of the fruits and to render the testas permeable improves germination (17). Correctly treated seeds commonly average from 20 to 30 percent germination following stratification at 2° to 5° C (36° to 41° F) for 110 to 130 days. Germination is epigeal. Early harvesting followed by immediate sowing has also been suggested for overcoming dormancy of basswood seeds. Collections should be made when seed coats turn brown but before they become dry and hard, or more specifically, when the moisture content is 20 to 40 percent of the green weight (7,29). Shading aids the establishment and initial survival of basswood seedlings but heavy shade limits subsequent growth and development, and vigorous growth is unlikely under the forest canopy. Likewise, higher soil temperatures found in forest openings are suitable for greatest growth of basswood seedlings (3). Basswood seedlings first develop a long taproot, which is soon supplemented by lateral roots. First-year seedlings had a root penetration of 20.3 cm (8 in) with a lateral spread of 7.6 cm (3 in), and second-year seedlings had a root penetration of 21.3 cm (8.4 in) and a lateral spread of 18.3 cm (7.2 in) (30). Stem height was 5.6 cm (2.2 in) the first year and 9.4 cm (3.7 in) the second year. Cold storage of autumn-lifted basswood seedlings maintains root growth capacity and overall seedling vigor for spring planting. Autumn-lifted stock should be stored at a temperature of 5° C (41° F) and a relative humidity of 70-85 percent (46). Basswood has been successfully planted in Ontario on cutover land and abandoned farmland. On cutover land, survival was best when a light overhead canopy (8.0 m/ha or 35 ft/acre of residual basal area) controlled competing vegetation (36). Release of the seedlings from the residual overstory and undergrowth was recommended after three growing seasons. Fall plantings failed to survive. Early failures of hardwoods planted on old-field sites in Ontario have been attributed to the absence of mycorrhizal fungi (30), insufficient site preparation, and insufficient postplanting weed control (42,44). Fertilization at the time of planting had little effect on seedling survival or growth (43). Vegetative Reproduction- Basswood sprouts prolifically, and this vegetative regeneration can be managed for sawtimber. Sprouts commonly originate on the stump at the ground line, and vigorous sprouts occur over a wide range of diameter classes (31). Almost all trees 10 cm (4 in) in diameter and smaller will produce sprouts and more than half of sawlog-size trees can be expected to produce stump sprouts (23). However, early thinning of stump sprouts (preferably before they reach 5 cm (2 in) d.b.h. or about age 10) is needed to ensure both good quality and rapid growth. Clumps should be thinned to not more than two stems; such thinnings will reduce the incidence of stem degrade due to decay, seams, and sweep (23,38). Because an extensive root system already exists, a basswood sprout has a higher probability of replacing a parent stem than does a sugar maple seedling. Thus, the ability to produce abundant stump sprouts allows basswood to maintain itself in a stand with the more shade-tolerant maple despite the much larger numbers of sugar maple in the subcanopy (13). Growth and Yield- This species reaches a height of 23 to 40 m (75 to 130 ft) with a d.b.h. of 91 to 122 cm (36 to 48 in). Under favorable conditions, trees sometimes attain a height of 43 m (140 ft) and a d.b.h. of 137 cm (54 in). Estimates of maximum longevity generally exceed 200 years. Basswood grows faster than most other northern hardwood species. On the same site, basswood often exceeds sugar maple and yellow birch (Betula alleghaniensis) in site index by 1.5 rn (5 ft) and beech by 3 rn (10 ft) (11). Diameter growth for basswood averaged 3 mm. (0.11 in) per year in three unmanaged stands in northeastern Wisconsin (site index at base age 50 years for basswood of 21.3 m or 70 ft). The same site under managed conditions produced substantially higher growth rates. Annual diameter growth average for a crop tree release was 4.6 mm (0.18 in); for a 20.7 m² and 17.2 m² /ha (90 ft² and 75 ft² /acre) (residual sawtimber) selection cut, it was 3.8 and 4.8 mm (0.15, 0.19 in); and for a group selection cut, it was 3 mm (0.12 in). Relatively narrow bark ridges and V-shaped fissures, with new light-colored inner bark visible in the fissures, represent a high-vigor basswood. In contrast, low-vigor trees have scaly bark with wide bark ridges and shallow, short fissures, frequently producing a rather smooth surface (12). Two phases can be noted in the renewal of cambial activity for basswood. The first phase is the reactivity of cambium that occurs independently of the initial meristematic activity within the overwintering buds. The second phase, accelerating cambial activity after bud-break, is presumably under the influence of primary growth (14). Winter stem contraction for basswood often exceeds stem expansion from the previous growing season. The amount of winter shrinkage in basswood stems was greater than that of yellow birch, sugar maple, or hemlock (Tsuga canadensis) (49). The period of shoot elongation for basswood in northern areas is shorter than that for other hardwoods-only red oak and sugar maple had shorter periods of terminal shoot elongation among seven species studied in northern Wisconsin. Based on an average of three growing seasons, shoot elongation for basswood began in May and was completed by the first of June (10). Longer periods of shoot elongation have been noted for open-grown basswood in Illinois and basswood plantations in Ontario (mid-May to mid-August). Chlorophyll is found in xylem rays and primary xylem of basswood twigs (47). Although the photosynthetic contribution is not large, it may have seasonal significance when leaves are absent. Rooting Habit- The initial taproot observed in basswood seedlings gives way in saplings to a system of lateral roots (5). This early root development is gradually obscured by the intensive development of oblique roots in the central mass, and surface lateral roots extend out from this mass (16). Adventitious roots have developed on the lower stem of basswood engulfed by dune sand (4). Reaction to Competition- Although basswood is less shade tolerant than its common associate, sugar maple, vigorous sprouting and rapid sprout growth allow it to persist under the selection system. Overall, American basswood is most accurately classed as tolerant of shade. This great sprouting vigor also helps it compete with the abundant regrowth following clearcutting. On an excellent site in the central Appalachian hardwoods, basswood was second only to sugar maple in number of stems 7 years after clearcutting. On a good site and a fair site, however, basswood was not among the five most numerous species during the same period (39). For reproduction from seed, the shelterwood system should provide the partial shade necessary to control competing vegetation, and to create a microclimate suitable for germination. After basswood is established, the overstory should be removed. Closely spaced, forest-grown trees develop straight, columnar trunks and narrow crowns, but open-grown trees have short stems and many large branches. Damaging Agents- Basswood plantations established on weed-infested old-field sites are susceptible to girdling by mice and voles, and completely girdled trees die. In a southern Ontario plantation, 44 percent of the basswood stems were completely girdled and 39 percent were partially girdled (41). The species responsible for the girdling, the meadow vole, does most of this damage feeding beneath the snow. Rabbits also feed heavily on seedlings and small saplings in both plantations and natural stands. Basswood seeds are eaten by mice, squirrels, and chipmunks, thus reducing the chances of seedling establishment. Quebec, it was classified as intermediate in susceptibility to gypsy moth defoliation (27). The foliage is host to various diseases-anthracnose (Gnomonia tiliae), black mold (Fumago vagans), and leaf spot (Cercospora microsora)-but none seem to do serious damage. The wood of basswood decays easily and once exposed can be host to many of the common hardwood decay organisms such as the yellow cap fungi (Pholiota limonella) and Collybia velutipes. Phellinus igniarius, Ustulina deusta, and nectria canker (Nectria galligena) also are found on basswood. Little defect is encountered in basswood when harvested before it reaches 120 years of age. Beyond this age, the chances of losses due to decay are greatly increased. Cull studies in the forests of Ontario indicate that yellow-brown stringy rot was the most common bole defect encountered; brown stain, some incipient yellow rot, and green stain were also found (8). The thin bark of this species is easily damaged by fire (13). Basswood is one of the hardwoods least susceptible to late spring frosts (40). Basswood has relatively soft wood that works exceptionally well and is valued for hand carving. The inner bark, or bast, can be used as a source of fiber for making rope or for weaving such items as baskets and mats. Basswood flowers produce an abundance of nectar from which choice honey is made. In fact, in some parts of its range basswood is known as the bee-tree. Throughout the Eastern United States, basswood is frequently planted along city streets. The number of native taxa in the genus Tilia has been debated for some time. As many as 15 native species and 13 varieties are named in early taxonomic work. Only three species of Tilia are now recognized in the United States, T. americana L., T. caroliniana Mill., and T. heterophylla Vent. (24). Recent studies, however, suggest that the genus Tilia in eastern North America should be considered a single, but highly variable, species. In sampling Tilia from Quebec, Canada, to Lake County, FL, no apparent morphological discontinuities between populations were found to justify delimitation at the species level (20). Allen, D. C. 1987. Insects, declines and general health of northern hardwoods: issues relevant to good forest management. p. 252-285. In Managing Northern Hardwoods, Proceedings of a Silvicultural Symposium. Society of American Foresters Publication No. 87-03, Washington, D.C.
Anderson, G. J. 1976. Pollination biology of Tilia. American Journal of Botany 63:1203-1212. Ashby, W. C. 1960. Seedling growth and water uptake by Tilia americana at several root temperatures. Botanical Gazette 121:228-233. Ashby, W. C. 1962. Germination capacity in American basswood. Transactions Illinois Academy of Science 55:120-123. Ashby, W. C. 1962. Root growth in American basswood. Ecology 43:336-339. Ashby, W. C. 1976. Basswood seedlings outgrow red and bur oak in full light or heavy shade. Tree Planters' Notes 27:24-26, 34. Bailey, C. V. 1961. Early collection and immediate sowing increases germination of basswood seed. Tree Planters'Notes 46:27-28. Basham, J. T., and Z. J. R. Morawski. 1964. Cull studies, the defects and associated basidiomycete fungi in the heartwood of living trees in the forests of Ontario. Canadian Forestry Service Department of Forestry, Publication 1072. Ottawa, ON. 69 p.
Braun, E. Lucy. 1964. Deciduous forests of eastern North America. Hafner, New York and London. 596 p.
Buech, R. R. 1976. Tree shoot elongation in northern Wisconsin and relationships with temperature and precipitation. Canadian Journal of Forest Research 6:487-498. Carmean, W. H. 1979. A comparison of site index curves for northern hardwood species. USDA Forest Service, Research Paper NC-167. North Central Forest Experiment Station, St. Paul, MN. 12 p.
Carvell, K. L., and W. Moxey. 1971. A practical method of evaluating forest tree vigor. West Virginia Agriculture and Forestry 3:4-5. Deshpande, B. P. 1967. Initiation of cambial activity and its relation to primary growth in Tilia americana L. Thesis (Ph.D.), University of Wisconsin, Madison. 65 p.
Fayle, D. C. F. 1962. What's known about basswood. Canadian Forestry Service Department of Forestry, Forest Resource Branch Mimeo 62-4, Ottawa, ON. 20 p.
Fowells, H. A., comp. 1965. 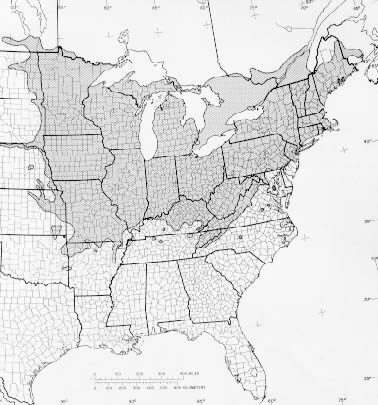 Silvics of forest trees of the United States. U.S. Department of Agriculture, Agriculture Handbook 271. Washington, DC. 762 p.
Harper, K. T. 1963. Structure and dynamics of sugar maple-basswood forests of southern Wisconsin. Thesis (Ph.D.), University of Wisconsin, Madison. 143 p.
Hickok, L. G., and J. C. Anway. 1972. A morphological and chemical analysis of geographical variation in Tilia L. of eastern North America. Brittonia 24:2-8. Houston, D. R. 1979. Classifying forest susceptibility to gypsy moth defoliation. U.S. Department of Agriculture, Agricultural Handbook 542. 19 p.
Houston, D. R. 1986. Insects and diseases of the northern hardwood forest ecosystems. p. 109-138. In The Northern Hardwood Resource: Management and Potential. Michigan Technological University, Houghton. Johnson, P. S., and R. M. Godman. 1983. Precommercial thinning of oak, basswood, and red maple sprout clumps. p. 124-142. In Silviculture of Established Stands, Proceedings SAF Region V Technical Conference, Duluth, MN. Society of American Foresters, Washington, D.C.
Jones, G. N. 1968. Taxonomy of the American species of linden (Tilia). Illinois Biological Monographs 39. University of Illinois Press, Urbana. 65 p.
Kallio, E., and R. M. Godman. 1973. American basswood ... an American wood. USDA Forest Service, FS-219. Washington, DC. 8 p.
Mauffette, Y., and L. Jobin. 1983. Host preferences of the gypsy Moth, Lymantria dispar(L.), in southern Quebec. Canadian Journal of Forest Research 13:53-60. Mitchell, H. L., and R. F. Chandler, Jr. 1939. The nitrogen nutrition and growth of certain deciduous trees of northeastern United States. Black Rock Forest Bulletin 11. Harvard University, Cambridge, MA. 94 p.
Mohn, C. A. 1964. Timing of seed collections to increase germination of basswood seed. University of Minnesota, Forestry Notes 152. Minneapolis. 2 p.
Park, J. H. 1971. Some ecological factors affecting the formation of Cenococcum mycorrhizae on basswood in southern Ontario. Canadian Journal of Botany 49:95-97. Rowe, J. S. 1972. The forest regions of Canada. Canadian Forestry Service, Publication 1300. Ottawa, ON. 172 p.
Stroempl, G. 1965. Germination of early collected fruit of Tilia americana L. Research Report 64. Ontario Department of Lands and Forests, Ottawa. 22 p.
Stroempl, G. 1968. Relationships of fruit and seed form, size, weight and soundness of graded basswood fruit. Tree Planters'Notes 19:1-7. Stroempl, G. 1969. Fruit defects in basswood (Tilia americana L.). Forestry Chronicle 45:172. Stroempl, G. 1971. Planting of basswood is successful in hardwood cutovers. Tree Planters'Notes 22:26-29. Stroempl, G. 1983. Growth response of basswood and sugar maple to an intermediate cutting. Ontario Ministry of Natural Resources, Forest Research Report 107. 19 p.
Stroempl, G. 1983. Thinning clumps of northern hardwood stump sprouts to produce high quality timber. Ontario Ministry of Natural Resources, Forest Research Information Paper 104. 27 p.
Tryon, E. H., and R. P. True. 1964. Relative susceptibility of Appalachian hardwood species to spring frosts occurring after bud break. West Virginia Agricultural Experiment Station, Bulletin 503. Morgantown. 15 p.
Von Althen, F. W. 1971. Mouse damage in a 8-year-old plantation. Forestry Chronicle 43:160-161. Von Althen, F. W. 1976. Effects of site preparation and postplanting weed control on the survival and height growth of planted hardwood seedlings. Canadian Department of Forestry, Report O-X-248. Sault Ste. Marie, ON. 15 p.
Von Althen, F. W. 1976. Fertilization at time of planting fails to improve growth of hardwood seedlings. Canadian Department of Forestry, Report O-X-249. Sault Ste. Marie, ON. 13 p.
Von Althen, F. W. 1977. Weed control with simazine revitalizes growth in stagnating hardwood plantations. Canadian Department of Forestry, Report O-X-261. Sault Ste. Marie, ON. 20 p.
Von Althen, F. W. 1981. Personal communication. Webb, D. P., and F. W. Von Althen. 1980. Storage of hardwood planting stock: effects of various storage regimes and packaging methods on root growth and physiological quality. New Zealand Journal of Forestry 10:83-96. Wiebe, H. H. 1975. Photosynthesis in wood. Physiologia Plantarum 33:245-246. Winget, C. H. 1964. Silvical studies of yellow birch and associated species in Wisconsin. Thesis (Ph.D.). University of Wisconsin, Madison. 172 p.
Winget, C. H., and T. T. Kozlowski. 1964. Winter shrinkage in stems of forest trees. Journal of Forestry 62:335-337.